The year was 2010. 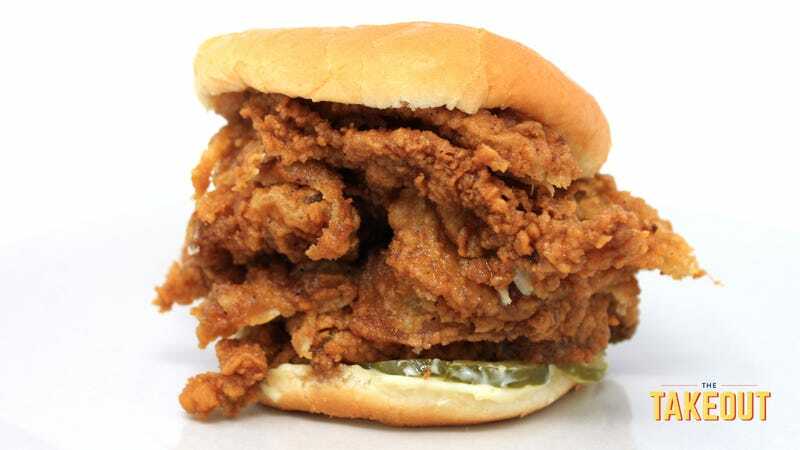 KFC’s Double Down sandwich was unleashed to the masses. The country did not know whether it was intended as a practical joke. That a sandwich would employ fried chicken as buns was, on its face, too absurd to be taken for real. Where KFC underestimated was that America often takes parody and subsumes it into legitimacy. The Double Down became a very real, very successful thing. My first attempt at a KFC Skinwich sometime around 2010. Last night, I made it again. And I ate it. It was, in every sense, a fat sandwich. A sandwich of fat. It’s simultaneously flaccid and crisp and chewy, as if a truck bomb of salt and MSG detonated in your mouth. It tastes exactly what you’d expect a sandwich with an 8-piece bucket worth of chicken skin shingled between bread would taste like. It has the flavor density of fried chicken factorial. There is only one proper way of eating this, and that is as the French do with whole ortolan birds—beneath a white cloth to shield your shame from God. Slather mayonnaise onto potato bun and add a few slices of pickles. Then, carefully remove the skin—in one piece, if possible—of the four chicken thighs and four breasts. Shingle pieces of skin between bun. Recite passages from the Book of Revelations. Eat immediately.